It's the time of year for ghosts and goblins and Slotastic online casino has just introduced a spooky new Halloween slot game from Realtime Gaming. 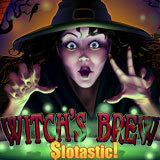 The magical new Witch’s Brew slot arrived today and Slotastic is giving an up to $313 casino bonus that includes 31 free spins on the new game. Casino bonus up to $313 plus 31 free spins available until October 31, 2016. With mysterious black cats, bubbling cauldrons and magical potions spinning alongside ingredients like toads and eyes of newts on its five reels, the bedazzling new Witch’s Brew slot has two mystifying bonus features. One holds Wild symbols until the next spin and the other awards up to 125 free spins. There are two wild symbols, a Witch and a Dragon Fang. The Wild Brew Feature is triggered when three of the same Wild symbols appear on the middle three reels. Their reels are held in place, guaranteeing 3 wilds in the next spin. 3, 4 or 5 Goblin Blood scatter symbols trigger 10, 25 or 125 free spins. All wins during the Goblin Blood Feature pay double. You can try the new Witch’s Brew slot game on your desktop or laptop computer in either the downloaded or instant play casinos. It’s also featured in the mobile casino for smartphones and tablets. Slotastic has hundreds of games from RTG including several other spooky games that are perfect for Halloween including Eternal Love, Count Spectacular. Voodoo Magic, Goblin’s Treasure and Haunted Opera.